A double cheese update this week. Now I’ve perfected my Chèvre recipe I decided to buy some raw goat’s milk and see how different it was compared to shop bought pasteurised milk. Hopefully in the future we’ll be getting milk from Diaz and Santiago our golden guernseys so I’ll be using raw milk in all my cheesemaking. Well there was definitely a difference. 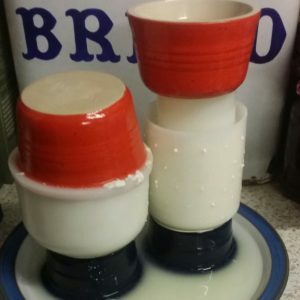 My yield was significantly increased when using the raw milk and because the curd formation was better the whey drained quicker which meant the end result wasn’t as wet. 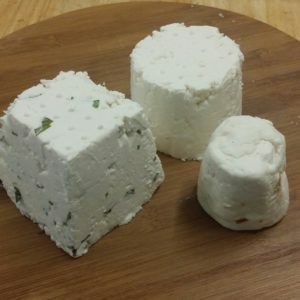 I had enough cheese to make a plain Chèvre as well as a basil flavoured one, using homegrown fresh basil and a chilli flavoured on using a homegrown dried basket of fire chilli. My favourite is the chilli flavour. I like the way the smooth creaminess of the Chèvre is followed by the heat of chilli, it’s a very moreish cheese. Not that the Basil and plain aren’t also delicious. I read an article this week that described Basil as catnip for humans so I’m going to be taking the Basil flavoured Chèvre to a bring and share lunch at my workplace. 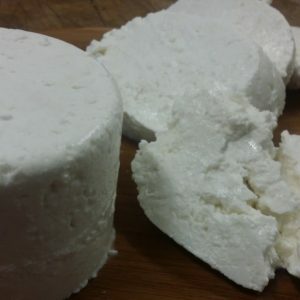 The second cheese I made this week was Paneer. It’s a vegetarian cheese that does not require rennet. Instead the cheese is formed using a combination of acid and heat. This method of cheesemaking relies on the nature of milk proteins. Casein, the most abundant of milk proteins coagulates with the aid of rennet and is what most other cheeses are made from. The second most common protein in milk is albumin which is what makes paneer. Albumin is also found in egg whites. A liquid at room temperature, albumin becmes solid when heated and will not return to a liquid state. When cheeses are made at a lower temperature the casein coagulates into cheese but the albumin remains in its liquid form in the whey. This is hwy you can make ricotta from whey. When making paneer the milk is heated to a higher temperature so both the casein and albumin form curds. This means that you have a slightly higher yield. Because of the nature of paneer you can use it in ways that you can’t use other cheeses. Paneer can be cooked ina sauce and will hold its shape, absorbing the sauce’s flavour. Paneer can also be cut into cubes and, stuck on a skewer and barbecued. One of my books even suggests making a cheese sandwich using paneer as the “bread” and a rich meltable cheese as the filling then fry the whole sandwich in butter. Any milk will make Paneer even skimmed. The only milk that won’t is UHT. The other benefit of paneer is that it freezes well. We ate some fresh in a curry and froze a couple of portions. Heat, acid made cheeses are common around the world not just in India where paneer originates from. In Mexico Queso fresco is essentially the same cheese but with spices such as garlic, chipotle pepper and coriander added. I’ll be writing up some recipe notes when I get time but here’s the recipe for Paneer. There are variations on this recipe mainly focused on different acids. Traditionally yoghurt is used, much larger quantities are required because yoghurt is only mildly acidic. Lemon juice makes a paneer suited to dessert. The paneer is ready when cooled and can be refrigerated for a week or frozen. As you can see I have some cheese forms. You could use a cut off plastic milk container or plastic bottle with holes punched in it for a diy version. Here’s a picture of the finished paneer.